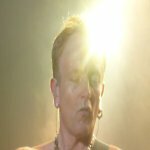 Def Leppard guitarist Phil Collen was interviewed by Billboard recently and mentioned the Pyromania Las Vegas residency may take place in late 2014. Phil talked (along with Vivian/Rick) to Billboard about the new album recordings, song writing, VIVA! Hysteria and the proposed return there. "The Vegas thing was amazing," guitarist Phil Collen told Billboard, referencing their "Viva Hysteria" residency at the Joint at the Hard Rock Hotel and Casino. "We're also going to be doing Viva Pyromania at some point at the end of next year."